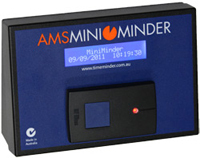 An AMS Time-Minder MINI-MINDER system is a breakthrough for Australian small business: a cost-effective time and attendance system designed to give you all the features of Time-Minder Version 5 software, supported by a clever and easy-to-use clock/reader. A MiniMinder package brings all the time-recording capability and efficiency of large companies to Australian small business. Save time preparing payroll, keep better records, record time more accurately and produce any kind of labour report at the touch of a button. This package is economical, reliable and ready-to-use. The MINI-MINDER clock communicates to your PC in real time, but has a built-in clock and data store to store swipes (up to 2000) in "real time" for later processing when PC is switched off. It can be mounted up to 1200m away from a networked computer (an extension cable is required for over 1.2m and an adapter is required for cable lengths over 30m). MiniMinder confirms swipes with a clear, audible beep. This time and attendance package is ideal for small businesses with up to 50 employees, working various shifts. As you expand, it is easy to add extra clocks, and the package can be upgraded to a full software licence allowing unlimited employees. 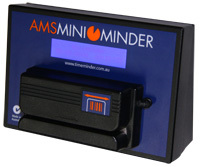 AMS offers a complete installation and training service for Time-Minder. We aim to get your system up and running in the minimum time and with maximum satisfaction. To find out more, contact us today.